Last April I posted an entry on the possibility of systematically producing regular languages which are subsets or supersets of a context-free language. The process I outlined involves creating a finite state automaton, augmented with counters and guards and whatnot (or equivalently, creating an attributed regular grammar with attributes and semantic conditions). My description of that process involved a certain amount of hand-waving, because I knew intuitively how to build such an automaton by hand (at least for simple cases), but had not yet figured out a good way to describe it more precisely. So I can now give a slightly simpler account of the FSA construction. For each position where the rule has a terminal symbol, include an arc from that position to the next position in that rule, labeled with the terminal symbol. For each position p where the rule has a non-terminal symbol N, (a) add arcs labeled with the empty string from p to the first position of each rule in the grammar where N appears on the left-hand side, and (b) add arcs labeled with the empty string from the final positions in each rule for N to the next position after p.
Add a new starting state; add arcs labeled with the empty string from the starting state to the first positions of the rules for the start symbol of the grammar. The accepting states of the automaton are the final positions of the rules for the grammar’s start symbol. I have not yet attempted anything like a proof, but I believe that the automaton thus constructed recognizes what my earlier post called the smallest regular superlanguage of the language you started with. That is, every sentence of the original language will be recognized by the automaton, and some non-sentences will also be recognized. The set of sentences recognized by the automaton can be characterized simply, by reference to the pumping lemma for context-free languages. In simple terms, this lemma says that for long enough sentences in a language, the sentence s can be partitioned into subsequences u, v, w, x, and y, such that s is the concatenation uvwxy, and such that for any positive integer n, the string uvnwxny is also in the language. The automaton recognizes the slightly larger set of sentences uvnwxmy for positive integers n and m. That is to say, it does not ensure (for example) that closing parens match opening parens in number or kind. But otherwise it captures the language. Plus a new starting state I’ll call 0. Accepting states are 2, 6, and 10. The regular expression “[[(]*a)]*” provides a compact equivalent. As you can see, it accepts a superset of the example language, but it is the smallest regular superset and does impose at least some of the constraints of the original grammar. Prove that the FSA whose construction is described above accepts a superset of the language accepted by the grammar from which it’s constructed. The augmented FSA that correctly recognizes the original language is, presumably, a re-invention of some well known parsing technique for context-free languages; which? Prove that the language recognized by the FSA is essentially the language uvnwxmy for every uvwxy decomposition of sentences in the original language. Can the largest practicable regular sublanguage be constructed using this FSA? 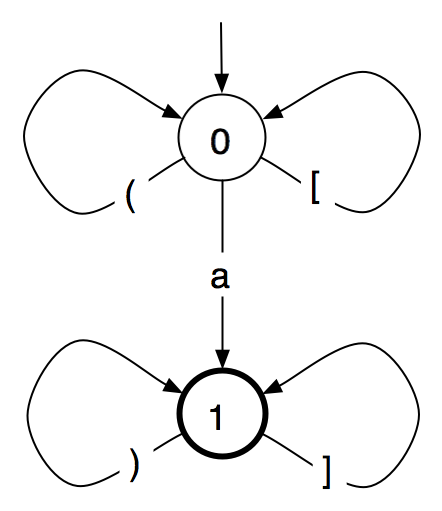 Earley parsing can, I think, be described in terms of this automaton, in the sense that the actions of an Earley parser can be translated into state changes in the automaton (with an external control that prevents making an illegal move). Can other parsing techniques also be? The preliminary program for Balisage 2009 is now up on the Web, in both full and brief forms. Most of this week I was in Illinois, attending a Summer Institute on Humanities Data Curation in the Humanities (SIHDC) sponsored by the Data Curation Education Program (DCEP) at the Graduate School of Library and Information Science (GSLIS) of the University of Illinois at Urbana/Champaign (UIUC). The week began on Monday with useful and proficient introductions to the general idea of data curation from Melissa Cragin, Carole Palmer, John MacMullen, and Allen Renear; Craigin, Palmer, and MacMullen talked a lot about scientific data, for which the term data curation was first formulated. (Although social scientists have been addressing these problems systematically for twenty or thirty years and have a well developed network of social science data archives and data libraries, natural scientists and the librarians working with them don’t seem to have paid much attention to their experience.) They were also working hard to achieve generally applicable insights, which had the unfortunate side effect of raising the number of abstract noun phrases in their slides. Toward the end of the day, I began finding the room a little airless; eventually I concluded that this was partly oxygen starvation from the high density of warm bodies in a room whose air conditioning was not working, and partly concrete-example starvation. If in giving an introduction to TEI you don’t go into some detail about the things it can do, no one will understand why people might prefer to archive data in TEI form instead of HTML or straight ASCII. If you do, at least some in the audience will conclude that you are asking them to do all the work, instead of (as here) making them aware of some of the salient properties of the data they may be responsible in future for curating (and, a fortiori, understanding). Wednesday morning, I was on the program under the title Markup semantics and the preservation of intellectual content, but I had spent Monday and Tuesday concluding that I had more questions than answers, so I threw away most of my plans for the presentation and turned as much of the morning as possible into group discussion. (Perversely, this had the effect of making me think I had things I wanted to say, after all.) I took the opportunity to introduce briefly the notion of skeleton sentences as a way of representing the meaning of markup in symbolic logic or English, and to explain why I think that skeleton sentences (or other similar mechanisms) provide a way to verify the correctness and completeness of the result, when data are migrated from one representation to another. This certainly works in theory, and almost certainly it will work in practice, although the tools still need to be built to test the idea in practce. 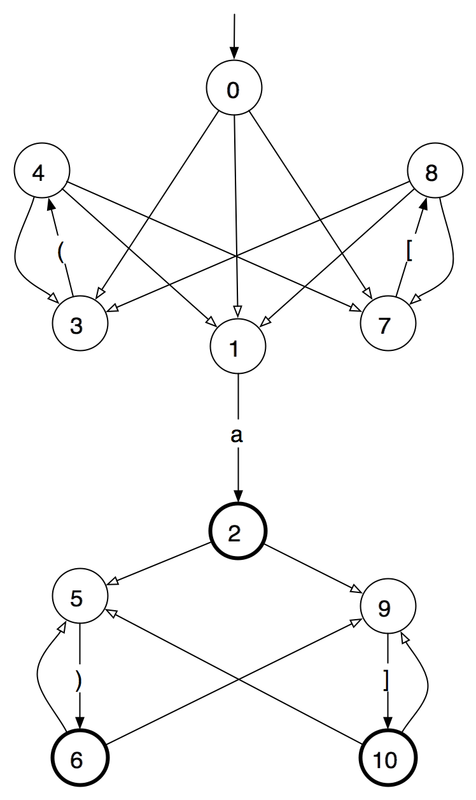 When I showed thd screen with ten lines or so of first-order predicate calculus showing the meaning of the oai:OAI-PMH root element of an OAI metadata harvesting message, some participants (not unreasonably) looked a bit like deer caught in headlights. But others seemed to follow without effort, or without more puzzlement than might be occasioned by the eccentricities of my translation. And at the end of Thursday, Lorcan Dempsey, the vice president of OCLC, gave a thoughtful and humorous closing keynote. The first question led to a consideration of collection development policy and its (often unrecognized) relevance to data curations; the second led to an extremely helpful analysis of the threats to data against which data curators must fight. I won’t try to summarize her talk further; her slides and her blog post about them will do it better justice than I can.